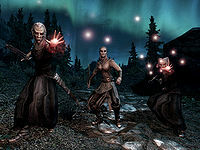 Este artigo é sobre the quest. 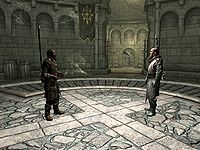 Para other uses, veja Dawnguard (disambiguation). 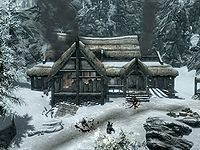 Take the road that leads east from Riften. Right after the road turns southeast and you cross a small bridge, start watching the cliffs to your left. You'll find a small crack in the side of a cliff—the entrance to Dayspring Canyon. It's found between a hollow green log and a broken birch tree. 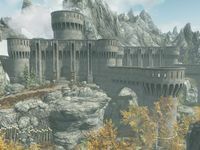 A narrow, winding path leads you towards the fortress, Fort Dawnguard. 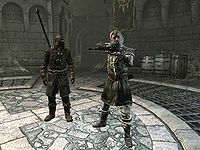 You may pass Durak on the path to the fort, practicing his skill with a crossbow. If you ask him what he's using, he'll answer "Never seen a crossbow before? Not surprised. Kind of a Dawnguard specialty. Nothing better for putting down vampires." He will then give you your own crossbow, along with 45 steel bolts. Esta página foi modificada pela última vez à(s) 18h25min de 9 de janeiro de 2016.